i. India and Tanzania signed two MoUs in presence of External Affairs Minister Sushma Swaraj and Tanzanian Foreign Minister Dr. Augustine Mahiga. The MoUs are between Foreign Service Institute of India and Centre for Foreign Relation, Tanzania and National Research Development Corporation and Tanzania Industrial Research and Development Corporation. ii. The agreements were signed following India-Tanzania 9th Session of Joint Commission on Economic, Technical and Scientific Cooperation in New Delhi. i. 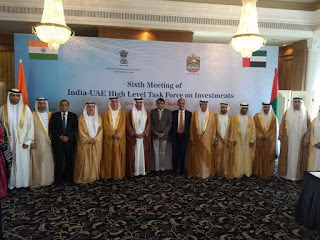 The sixth meeting of the UAE – India High Level Joint Task Force on Investments (‘the Joint Task Force’) was held in Mumbai to review the progress being made in addressing the agreed actions of the previous meeting held in Abu Dhabi in January 2018 and to elaborate a number of new key issues of mutual importance. ii. The two sides noted the positive outcomes achieved by the Joint Task Force to date and agreed upon the need to further explore ways to facilitate investment in key Indian and UAE sectors with the potential for economic growth. · UAE Capital: Abu Dhabi, Currency: UAE Dirham. i. Canada has become the second country after Uruguay to legalize possession and use of recreational cannabis. ii. Canadians can now grow up to four plants in their own home and carry up to 30 grams of dried cannabis for personal use. Cannabis possession first became a crime in Canada in 1923 but medical use has been legal since 2001. · Canada Capital: Ottawa, Currency: Canadian dollar. i. Online financial services marketplace BankBazaar has appointed former RBI Deputy Governor (DG) S S Mundra as an advisor to the company. Mundra was a deputy governor at the RBI for three years till July 2017.
ii. BankBazaar Co-Founder & CEO Adhil Shetty stated that as the digital mode is increasingly becoming the preferred way to transact, there is a greater need for collaboration between fin-tech, regulators, and financial institutions. i. Former editor MJ Akbar has resigned from his post of Minister of State for External Affairs amid sexual harassment allegations against him by over sixteen female journalists. i. Northern Irish author Anna Burns has won the 2018 Man Booker Prize for her novel 'Milkman', which is her third full-length novel. ii. The book is about an 18-year-old girl, known as "middle sister", who is sexually harassed by an older paramilitary figure, called the "milkman". Anna Burns has become the first Northern Irish author to win the Man Booker prize. · The Man Booker Prize for Fiction (formerly known as the Booker–McConnell Prize and commonly known simply as the Booker Prize) is a literary prize awarded each year for the best original novel written in the English language and published in the UK. i. 'Beeg Ani Beegath', a collection of short stories in Konkani by the well-known writer, journalist, and critic H M Pernal bagged the prestigious 'Vimala V Pai Vishwa' Konkani best book award for the year 2018. H M Pernal is the pen name of Henry M Mendonca. ii. Konkani poet Sharathchandra Shenoy from Kochi won the Vishwa Konkani best poetry award for his book 'Idam Na Mama,' while Vishwanath M Shet from Uttara Kannada bagged the Vishwa Konkani lifetime achievement award. Each award carries a purse of Rs one lakh each, a certificate, memento and shawl. i. The United Nations’ (UN) International Day for the Eradication of Poverty is observed on October 17 each year since 1993.
ii. The theme for International Day for the Eradication of Poverty 2018 is "Coming together with those furthest behind to build an inclusive world of universal respect for human rights and dignity".